Canopy Fitting 1 5/8" Gold Medium Peak Left Side Sloped (110 Degree). The inside diameter of the opening is 1 3/4 inches. 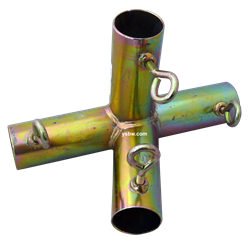 Uses 1 5/8 Chain Link Fence Tubing available at your local Hardware Store or Fence Company.